The Central Bank published the most recent release of their Monthly Statistics. This contains a host of data relating to the financial, banking and monetary sectors of the Irish economy. The end of the release gives an insight into aggregate credit card usage in Ireland in Table C14. The Central Bank do not present the data in a manner that makes it easy to work with but we can extract some information from it. By combining the data in the current release with the numbers presented in a previous release (September 2006) we can present monthly information beginning in June 2003. 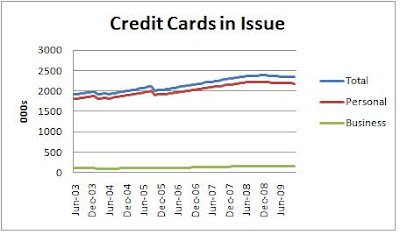 First, we can look at the number of credit cards in issue. About 93% of issued credit cards are for personal customers. The total number of cards in June 2003 was about 1.9 million. This rose gradually for five years and reached a peak of just under 2.4 million cards in January 2009. The total has fallen slightly over the past ten months and as of November 2009 stands at just over 2.3 million. All of this fall has been in personal cards. Looking at the change in the amount of debt on these cards, we see that credit card indebtedness was rising at an annual rate of in excess of 15% p.a. up until March 2007. 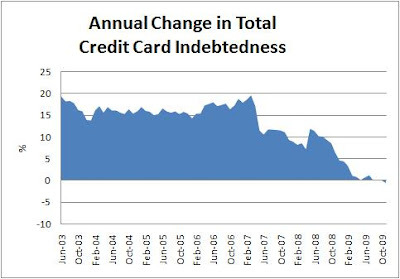 Since then there has been a dramatic drop in the rate we have been accumulating credit card debt. In November 2009, after hovering on zero for three months, the annual change was negative for the first time, i.e. 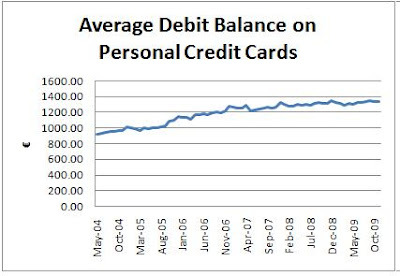 November 2009 was the first month that had a lower level of outstanding credit card debt that the same month of the previous year. Looking at the actual amount of debt on our credit cards, and two of the key drivers of this statistic, monthly credit card purchases and monthly repayments. The total amount of credit card debt at the start of the series in June 2003 was just over €1.5billion. The amount more than doubled over the next five years and peaked in December 2008 at about €3.1 billion. As of November 2009 this has dropped by €100 million to just over €3 billion. The monthly amounts of spending and payments are remarkable similar in the above graph and suggest that the difference between them is relatively small. 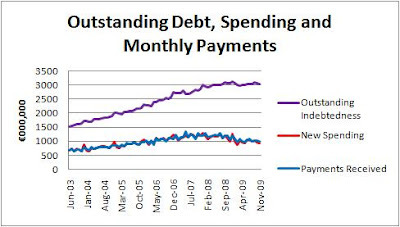 The following graph isolates the difference between spending and payments. 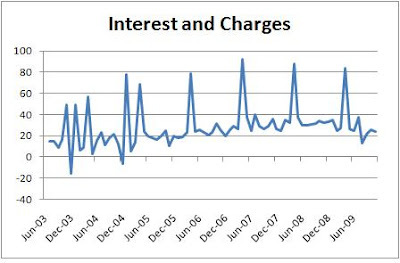 This shows the seasonal pattern in credit card spending with peaks evident for December of each year. 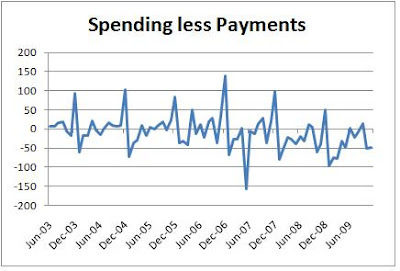 However for 44 of the 77 months in the series the level of payments exceeded the level of spending. In fact over six years there is an excess of payments over spending of about €680 million. Let's reconcile this with our findings on total indebtedness. Over the period the balances on our credit cards increased by about €1.5 billion, yet we made payments of €680 million more than our credit card spending. What gives? Spending and payments alone do not account for credit card balances - the hidden evil is accumulated interest (and other charges). The peaks that approach €80 million correspond to April of each year when the annual government duty of €30 (previously €40) on credit cards is due. Ignoring each April in the sample, the average amount of interst and charges added to credit card balances is about €24 million a month or about €2 billion over the six years.